1. The Norwegian National Invention. When friends from Oslo came to visit, they came bearing their national invention: a cheese slicer. It's the kind of cheese slicer that's shaped like a pie server, only it has a sharp cutout along the base of the triangle. Glide the slicer along a piece of cheese, and a neat slice slowly emerges on the serving area, which you can then gingerly pick off with your fingertips. It doesn't take up much space and always reminds me of my friends. I like that it's special from their country, and yet not a crazy contraption. It's useful (and not all "special little tchotchkes" are). 2. Homemade jam. I'm a glutton for jam. I eat it by the spoonful. I slather it on bread, toast, graham crackers. I spoon it over yogurt and ice cream. When a friend came to visit with a little jar of homemade strawberry jam tucked into her suitcase, I was giddy. Similar to the cheese slicer, it's small and doesn't take up much space at all in a tiny New York apartment, and it's useful. Jam is a winner as a simply gift for a host or hostess, but it's extra special when it's homemade. 3. Coffee (or Tea). No guest will ever be turned down from my doorstep when they show up with a bag of good, strong, fresh roasted and ground coffee. If you know your host or hostess is a coffee drinker, spend $10-$12 for a pound of good coffee. Or, if you drink coffee but your hosts do not, bring whatever good coffee you like (see no. 10 on this list) so it'll be on hand in the morning when you need it, in addition to another gift that's a little more tailored to your hosts. Likewise, if you or your hosts are tea drinkers, good quality tea is always appreciated. Its long shelf life helps, too. 4. Salad servers. Another useful and fun item that doesn't take up too much space is a set of salad servers. We just got a new set from a couple who are visiting this summer. 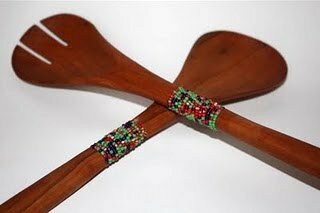 They were in Africa not long ago and picked up these gorgeous wooden salad servers that are decorated with tiny beads on the handles. One of the friends grew up in South Africa, so again, I like that this gift reflects something about him and his homeland. And I can never have too many salad servers. 5. Rosemary or other herb plant. Two years running, my mother has given me a rosemary plant in the shape of a Christmas tree sometime in December, when I invariably invite her and the rest of my family over for Baking Day. Both years I killed it before May, but hey, I tried. Unless your host or hostess has severe allergies or tends to kill plants (in my defense, I have a dozen other plants that are healthy and thriving! ), a simple potted herb plant, for about $4-$10, makes a great little gift.